The happs in the valley of the sun. Get the jump on these instruments! These are just a few of the new stock we get every month. Come in and check them out! JAM NIGHTS ARE BACK-WITH A vengeance! Post NAMM Report – Coming Soon! Winter Rock Recital Coming Soon! Full ORANGE Amp line now available! Extra 10% off when buying guitar package of YOUR CHOICE! Back to his innovative building roots, Jamie White will be blazing an new trail through the bass world. We are proud to announce the arrival of his first handmade bass into our shop. Come by and check this beauty out. He is currently taking custom orders for both bass and guitar ! Thanx for 3 great years and more to come! Ramona Rock Recital Videos UP! Click Link for All videos!!! 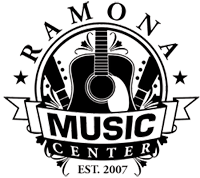 Ramona Music Center Open Mic Confirmed!!!! Nov 19th, 2010 at Kenrix Sushi in Ramona!!!! Call us for details!!! Trav with the legendary Joey Cape!!!! Mark at the Abbey Road!! Waterloo!!! New home of the Deering Goodtime Banjos! After an amazing tour of the Deering factory with my friend Aislinn, we signed the paperwork to get some of those beautiful instruments in our store! For those of you familiar with the goodtime series, they have gone through some changes! 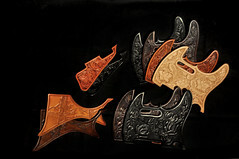 New bowtie inlays, new traditional headstock, and new finish options! Lots of cool things goin on at the store!!! Aja Alycean at Del Mar! First person to play the opening theme at tempo gets a free Tshirt! Londons Falling on 1320 AM! Click to hear the interview! ALSO! Thank you to everyone who came out to play and support us on Sunday! We had a blast even in the scorchin sun and saw live music on main st. for the first time in years. More to come! First customer to play the first 4 bars of Brad Paisleys “Nervous Breakdown” correctly and up to tempo (160 Bpm!) wins $5 of merchandise FREE!!!!! How hot are your chops?? Wear your RMC shirt on your musical adventures and make the website just like Aislinn Brody pictured with Protest the Hero!! Our journey has ended and we bring exciting news from Anaheim. For those of you questioning the abbreviation, there is a show put on by the National Association for Music Merchants in Anaheim where buyers and sellers in the industry come together to discuss, release, and show-off their latest and greatest! Quite the spectacle indeed. This kids got 99 problems but his axe ain’t one. Southpark Bar and Grill Blues Jam Every Saturday! Ramona High School Royal Alliance!! WOW! Atmadja by Cirque Du Soliel performed live by our own RHS Marching Band! Good Job Guys! 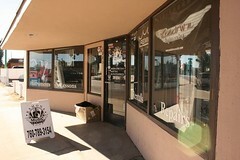 Welcome to the new RamonaMusicCenter.com. It is obviously under construction and being updated constantly so keep checking back. In the meantime, check myspace.com/ramonamusiccenter for more information on our musical community!